Accredited again in 2015, South Hills Middle School serves students of varied economic, social, ethnic and religious backgrounds. Located in the rapidly growing city of Riverton, the school’s spacious building and well-groomed campus are assets to the community. South Hills Middle School is a traditional story design featuring self-contained classrooms, shop and home economics areas, choral and band rooms, media center, auditorium, gymnasium, and office suite. The commodious building dates from 1998 and offers many amenities not included in Jordan District’s older middle schools. 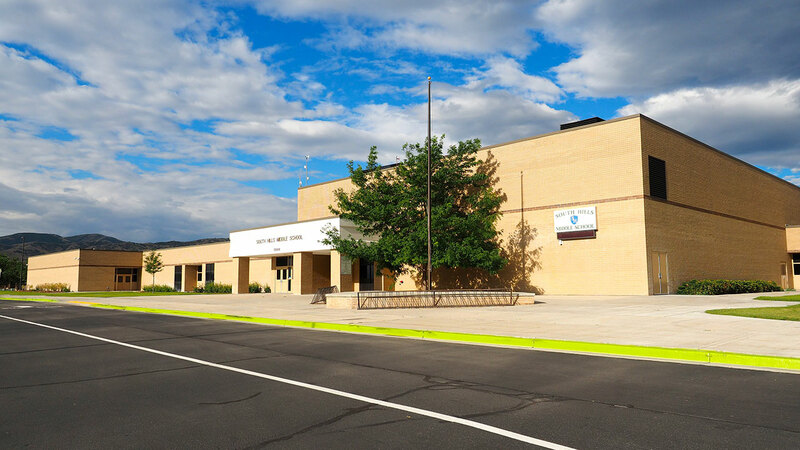 South Hills Middle School has been designated as a School to Watch by the National Forum to Accelerate Middle-Level Reform and is one of only eight schools in the State of Utah to receive this prestigious designation. Our faculty is recognized for their quality of instruction, individualized interventions for students, and their tradition of collaboration for student improvement and learning. The school serves some 1,000 students in grades seven, eight and nine in the cities of Riverton and Bluffdale. Students attend school on a regular nine-month, 180-day calendar with the summers off. The curriculum meets or exceeds District and State core curriculum standards and includes a wide range of required and elective courses in the arts, career and technical education, music, theatre, dance, and world languages. The pupil/teacher ratio is 1 to 26.30 in grades 7 and 8 and 1 to 27.00 in grade 9, but actual class sizes vary. The 56-member faculty includes a mix of veteran and new educators. All are state certificated and well prepared in their teaching fields. Both teachers and administrators undergo formal evaluations each year. In the 7th and 8th grades, students are grouped into interdisciplinary teams in science, English language arts, and social studies. These teams focus on cross-disciplinary connections, teamwork, and individual supports for the middle level learner. Students can participate in a wide variety of co-curricular activities, including the National Junior Honor Society, student government, stage crew, PTSA student board, Tiger Squad, debate team, Science Olympiad, MESA, and an Art Matters group. The school also offers a wide variety of academic interventions to support students’ learning such as ZAP (Zeroes Aren’t Permitted – a homework accountability system), a FLEX period where students are re-taught important concepts, raise their grades or participate in academically and socially enriching activities, a teacher advisory period where students are taught the TIGER Traits, after school tutoring, study skills classes, an online math tutoring program, academic coaching, motivational and behavioral modification groups, and other supports. A full resource team, school psychologist, and teachers for students with behavioral disabilities and learning disorders are on staff to serve students. The educational and behavioral needs of students with disabilities can be met at a tiered level of instruction from inclusion co-taught classrooms, to pullout resource and self-contained classroom settings. Our Counseling Center offers access to three knowledgeable and supportive counselors. The Center provides services, groups, academic coaching, career and college planning, and supports for a variety of issues or concerns students and parents may have as they navigate through the middle years. There are teachers certified to teach and support second language learners at each grade level. Computer science classes and specially equipped computer classrooms provide students with opportunities for technology training. Currently, the school boasts 7 desktop computer labs, one iPad mobile lab, and 14 Chromebook mobile labs. Students have access to a beautiful media center with a diverse selection of reading material to suit readers of all tastes and preferences. Students are expected to attend classes regularly and to comply with school and district rules and policies. A computer tracking system helps monitor attendance. Staff members work closely with any student who has problems. An “Excellence Program” encourages students to do their best by rewarding academic achievement, good citizenship, exemplary attitudes, exceptional effort, etc. Nutritious hot breakfasts and lunches are provided daily. Bus service is provided for any who live two miles or more away from school. School volunteers are an important asset to the school; therefore, we encourage parent participation and community volunteers on a daily basis. Our active and supportive PTSA organization coordinates these volunteer opportunities. Visitors are always welcome and asked to stop by the office for a visitor’s pass before going to classes or moving through the building.